Child linking is used to link a child object of the equipment’s prefab to a child object of the combatant’s prefab when it’s equipped. 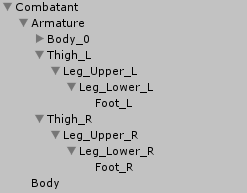 Let’s see how this works by linking trousers to the combatant’s legs. To successfully link an equipment to a combatant, the structure of the objects armature has to be equal where they’ll be linked. We’ll be linking the different child objects of the left and right leg to the equivalent object of the trousers, e.g. 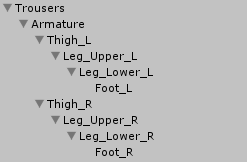 Armature/Thight_L on the trousers will be linked to Armature/Tight_L on the combatant. Where you place the equipment viewer component on your combatant’s prefab (and which Equipment Part it uses) depends on your actual game objects and equipment system design. We’ll just focus on linking the child objects. To link a child object of the equipment to the combatant, click on Add Child Link in the equipment viewer’s inspector. First, we’ll link the left thigh. This is the path to the child object on the combatant (starting from the root, ignoring the actual position of the equipment viewer). Now, click on Add Child Link again to add the left upper leg. Click on Add Child Link again to add the left lower leg. And now, the left foot. Click on Add Child Link again to add the right thigh. Again, click on Add Child Link again to add the right upper leg. And that’s it – don’t forget to apply the changes to your combatant’s prefab. From now on, when this equipment viewer displays an equipment with matching child objects, they’ll be linked to the movement of the combatant’s child objects.